All organisms break complex molecules into simpler molecules, thereby obtaining energy to sustain life. This energy is used to transport ions, pump blood, move the body, and many other functions. Energy use ultimately leads to the production of internal heat. Endotherms are capable of producing sufficient internal heat to elevate their body temperature (or part of their body) above environmental temperature. In contrast, ectotherms cannot produce sufficient internal heat to elevate their body temperature above environmental temperature. Endotherms have higher energy use than similar-sized ectotherms; consequently, endotherms consume more of the production by the ecosystem than do similar-sized ectotherms. The ability to be an endotherm depends on the rate of internal heat production, the size of the organism, the degree of insulation, and environmental circumstances. Many endotherms, such as mammals and birds, elevate their entire body temperature above the environmental temperature. In other cases, endothermy is regional, such that only some parts of the organism (e.g., the brain or locomotor muscle of tuna or the flower of plant) are heated above environmental temperature. In some organisms, endothermy is not continuous but occurs only periodically or during particular activities. For example, brooding pythons heat their body only while incubating eggs, and insects elevate temperature of their active flight muscles only prior to and during flight. In the older literature, the term endotherm was sometimes used interchangeably with the term homeotherm, but this usage is incorrect. Homeotherms are organisms that maintain relatively constant body temperature. In contrast, organisms whose body temperature varies substantially (generally tracking the environmental temperature) are called poikilotherms. Generally mammals and birds are homeothermic while most other animals are poikilothermic, but this is not always the case. For example, some Antarctic ice fish have body temperatures that show extremely little variation (and are below the freezing point of pure water). These fishes are home-otherms because their environmental temperature is relatively constant, not because they are thermoregulat-ing. On the other hand, some, but not most, mammals and birds are heterothermic. That means their body temperature varies over a wider range than is typical for homeotherms (but it does not necessarily track environmental temperature as in poikilotherms). This variation in body temperature may occur over short timescales, such as nightly torpor in bats and hummingbirds or the rather variable body temperatures ofsome mammals, such as the egg-laying echidna. Variation in body temperature of birds and mammals may also occur over seasonal time-scales, for example, as is seen in bears and ground squirrels. Animals that regulate their body temperature in the face of changing environmental temperature are called thermoregulators (Figure 1). 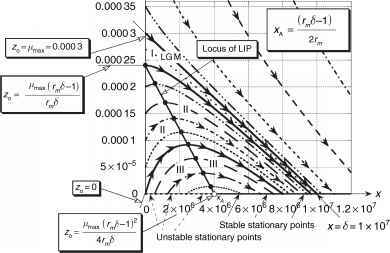 Thermoregulation can be accomplished physiologically by altering rates of heat production or heat loss. Animals may also thermo-regulate behaviorally by selecting warmer or cooler microenvironments. Animals whose body temperature tracks the environmental temperature are called thermo-conformers (Figure 1). 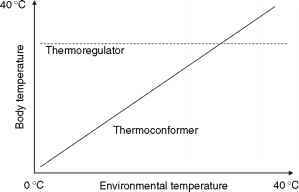 Figure 1 Change in body temperature of thermoregulators and thermoconformers with environmental temperature change. Two other common terms in thermal physiology are cold blooded and warm blooded. These terms are no longer widely used by biologists because they convey little useful information beyond the temperature of an animal (or its blood). For example, animals may be cold blooded at one time and warm blooded at another depending on their thermal environment. Many reptiles have high body temperatures (i.e., are warm blooded during the day) when the thermal environment is hot, but they may be cold blooded when the thermal environment is cold (e.g., at night or during winter). Similarly heterothermic birds and mammals may be warm blooded during some parts of the diurnal or annual cycle and cold blooded at other times. Other terms frequently used with relation to endothermy are standard metabolic rate (SMR), resting metabolic rate (RMR), basal metabolic rate (BMR), and field metabolic rate (FMR). SMR is metabolism measured at a particular environmental temperature while an animal is inactive and not digesting or absorbing food. RMR differs from SMR in that an animal may be digesting or absorbing food. BMR is a special case of SMR, when metabolic rate is measured within the thermoneutral zone (TNZ; see below). FMR is metabolic rate of animals in their natural environment. SMR, RMR, and FMR can be used to describe the metabolic rate of both endotherms and ectotherms, but the term BMR applies only to endotherms.